Superman is known for being an inspirational beacon of hope, never quitting when things look bleak and doing all he can to protect the world. A question has often been raised in some comics over whether or not Superman can change the world and truly stop humanity’s darker instincts from taking over. That question is directly addressed in Superman – Action Comics: The Oz Effect Deluxe Edition as the mysterious Mr. Oz puts Superman’s faith in humanity to the test. This story is the culmination of much of Dan Jurgen’s time on Action Comics, from Action Comics Vol. 1 to Superman Reborn and even before DC Rebirth, as the identity of Mr. Oz, the mysterious man in the green hood who has been secretly plaguing Superman’s life, is finally revealed. There are some interesting questions raised over Mr. Oz’s identity, such as whether his story is actually real and what his role in the bigger events of DC Rebirth he was meant to play. Its not too hard to figure out who he is now that DC has placed his face on the cover, but its still interesting what this means for Superman, DC Rebirth and possibly Doomsday Clock going forward. 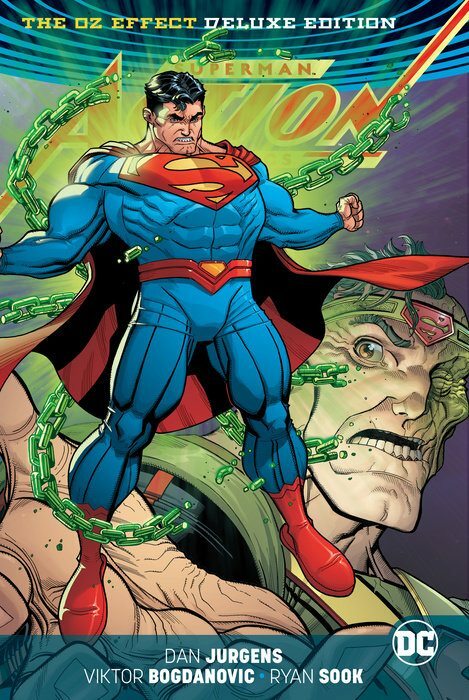 Jurgens writes a fairly compelling conflict between Superman and Mr. Oz, one that also includes a prelude to the event where Superman teams up with his former nemesis Lex Luthor on a case that loosely ties in with Oz. After that, the conflict largely shifts from a physical one to a much more philosophical battle as OZ tries to show Superman that fighting for humanity is hopeless as man will always be selfish, choosing their darkest desires over the chance to be good. Throughout all this, Superman has to race across the world to prevent tragedy after tragedy as Oz uses his influence to push for wars between countries or other terrible events. Jurgens takes some of these events fairly far, such as with a couple graphic animal pouchings, dead civilians and children in war or an uncomfortable moment in a child’s sweatshop. In cases like these, its almost hard to disagree with Oz on humanity’s lack of control. However, its a slippery slope since Superman knows Oz has been manipulating these people and pushing them towards evil. Oz says he gives people a ‘choice’, but its a choice he heavily influences. It still gives Superman and Oz’s battle much bigger stakes as Superman’s very purpose is questioned and those stakes are made more significant through the personal connection between them. Its a bit of a shame, though, that Lois Lane and Jon don’t play much of a bigger role in this story. They’re here and their roles, especially Jon’s, becomes more important later in the story, but their impact on the plot is relatively small. Jon for one seems a little too trusting of Mr. Oz while Lois is rightfully skeptical. Some of the points Jurgens makes, particularly at this point in the story, become a bit repetitive. Oz begins sounding like a broken record as he keeps repeating the same thoughts on humanity and there are even a couple reveals, such as Oz’s capture of Doomsday and Mxyzptlk, that are repeated as well. Oz reveals he had them, but then a few pages later Superman acts surprised upon seeing evidence of this and it seems like Oz had never mentioned this. The repetition and inconsistency keeps the story from feeling as tight as it could be. The art is done mostly by Viktor Bogdanovic with Ryan Sook filling in one of the issues. Both do a good job conveying the emotion on Superman’s face and in his body language with everything he goes through in the story. One of the final pages of The Oz Effect from Bogdanovic shows both how much weight Superman feels on his shoulders and his mental and moral exhaustion. The character work from Bogdanovic is well done, as is the opening and closing chapters from Guillem March and Will Conrad respectively. The Deluxe format of the book helps to really get a good look at the art, though there isn’t much in the way of bonus content aside from several variant covers and a minuscule sample of alternate designs for Mr. Oz. Despite some of the repetition, Jurgens still crafts an interesting story which places the philosophical battle above any physical one. His take on Superman is pretty great too; throughout his whole run Jurgens has put a lot of Superman’s best attributes at the forefront and here it is no exception as Superman’s unending faith in humanity and goodness is examined and remains at stake throughout the whole book. Bogdanovic’s art captures the emotion each character goes through and gives some great, if graphic, imagery of Oz’s devastation. Superman – Action Comics: The Oz Effect Deluxe Edition puts a nice end to the mystery surrounding Mr. Oz, one that will hopefully be picked up further in future stories of DC Rebirth.